The ultimate in luxury fireplaces has arrived in Calgary! Introducing Flare Linear Frameless Fireplaces. Flare Linear Frameless Luxury Fireplaces have arrived in Calgary just in time for the snowy weather. Flare has really been shaking up the international gas fireplace market, and for good reason. Their mission is to make the impossible, possible and it looks like they’ve managed to redefine Linear Frameless Fireplaces, raising the bar for luxury fireplaces in Calgary. In addition to an impressive array of features and functions that would impress any engineer, Flare fireplaces possess an undeniable wow factor. 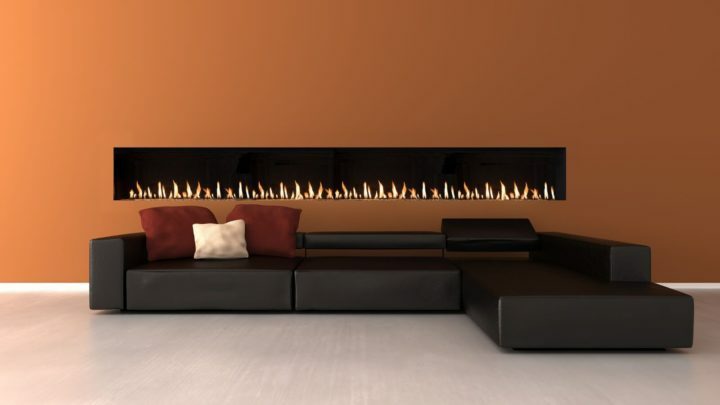 So, what’s so special about the Flare Linear Frameless Luxury Fireplaces Fireplace? There are five major aspects that make the Flare fireplace a stand out. The first is Flare Fireplace’s unique heat redirection system. Until now, fireplace owners needed to be mindful about placing electronics, televisions, art and other objects too close, or above their fireplace due to the heat emanating from the unit. Previously, luxury gas fireplaces in Calgary had to be placed quite a distance away from say, a flat screen tv. Precautions with children and pets had to be taken to avoid accidental burns or injuries from touching certain areas of the fireplace either at all, or for prolonged periods. Flare promises an entirely unwanted heat-free experience which it accomplishes in two ways. The first is a double glass technology. Two panes of glass separate the fire from touch and the Flare fireplace has built in blowers which actively cool the external pane of glass, making it safe for a brief touch. These blowers then direct heat elsewhere, where it’s wanted, into the fireplace enclosure, which then vents into the room thru a required air-space or vent. This amazing regulation of heat allows for “Cold Wall” above fireplace, perfect for mounting a TV or art above. This makes the Flare fireplace next level safe for both precious art and electronics as well as children and pets. The optional dual glass front creates a completely clean and modern look. This eliminates the need for screens! The second unique, state of the art function is the totally see through frame and screen. It’s really quite exceptional and has to be seen to appreciate the modern look and feel. It almost appears that the fire is floating on air! Those that place a premium on the modern, minimalist aesthetic, will find that Flare luxury fireplaces suits even the most discerning tastes in Calgary. Check out the video below to see Flare fireplaces in action! Whether you want to control your Flare fireplace from your tablet, smart home or sleek wall panel, there’s no doubt about it. Flare fireplaces are smart! The Myfire© app allows for total control of the Flare powerful fireplace functions that include the new Eco mode, program mode, thermostatic mode (fahrenheit or celsius ) and countdown timer. Flare luxury fireplaces Calgary boast the largest selection of modern direct vent linear fireplaces. Various widths and heights are available in Single Sided, See-Thru, 3-Sided, and Corner Fireplaces. These various sizes are ready for your project! Having trouble sourcing an 8 foot long fireplace? No problem, Flare has just the model for you. Want a never before seen selection of media options, including lighting, fireglass, stones and logs? Done. Flare boats an incredible variety, ensuring your fireplace is tailored to your specific taste. Flare is truly redefining luxury fireplaces for consumers in Calgary and around the world! Flare’s whole mission is to make the previously impossible, possible. All this luxury and state of the art technology and design doesn’t come cheap though, manufacturers suggested retail pricing shows that Flare fireplaces average cost is five figures. But for many, the value is more important than the price. For those who want stunning media options, impressive linear models and cutting edge heat management, Flare Linear Frameless Luxury Fireplaces really do deliver. Contact Diamond Fireplace to arrange a viewing or simply drop by our showroom to view the Flare fireplace today! DISCLAIMER: This article is intended as an overview of the Flare fireplace options and isn’t shouldn’t be construed as professional advice appropriate for every situation. Do your research and always read the safety precautions and user’s manual prior to purchasing and installing a fireplace to ensure you understand and consent to the requirements and safety precautions required to operate your fireplace.